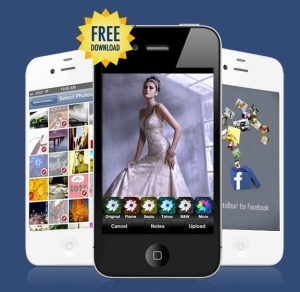 A new iPhone Application allow its user Manage and Edit Facebook Photos and Albums under one spot. A little Photoshop type iPhone Application called "PhotoBox" will do all work which Photoshop can do. Photobox App contains powered pack magical features of Photo Editing. Photobox is the first free iPhone app made to quickly and easily manage Facebook photos and albums. Features like Batch upload and download your Facebook photos, edit them, remove tags, and much more right from the palm of your hand. Are you tired of navigating the maze of Facebook albums? Do you wish you had a way to manage, edit and apply effects to your Facebook photos from one spot?? Well following features you will get from Photobox iPhone App. With timeline coming to everyone’s profiles, pictures are becoming even more important to Facebook users. There are many stellar apps out there that support only one area for photos sharing, filtering, searching, or managing. What we haven’t seen is one app that allows people to take charge of how they are represented on Facebook, whether it is editing photos or deciding which photos they share with friends. It is a gap that we saw in the market, and one that we’re excited to fill. Click here to Download Photobox iPhone Application to start photoshopped your Facebook Photos and Albums.